Much like American Independence Day on July 4, Canada Day on July 1 celebrates the birth of a nation with parades, fireworks, and parties all across the country. If you're going to be in Montreal this Canada Day, you won't want to miss the Défilé de la Fête du Canada this year. To attend the 2018 Canada Day Parade in Montreal, just show up at 11 a.m. on Ste. Catherine Street, between Fort and Peel for a peek, where the parade will officially start at the corner of Fort and Ste. Catherine. The parade ends at Place du Canada, at the corner of Ste. Catherine and Peel where yet more festivities await Montrealers. In order to get to the start of the parade by public transit, you can get off at either Guy-Concordia or Peel Metro. Alternatively, you can get out at other stations along the parade route using this map of the Montreal Canada Day Parade. Montreal began hosting a Canada Day Parade in 1977, just months after the separatist political party, Le Parti Québécois, first came to power back in November 1976. Initiated by Montreal cardiologist Roopnarine Singh, the first Canada Day Parade in Montreal was no more than a few cars tooting their horns around the city, a pale comparison to Canada Day festivities outside of the province and a conspicuous reflection of Quebec's political division: the sovereigntists versus the federalists. But this didn't stop the parade from happening. 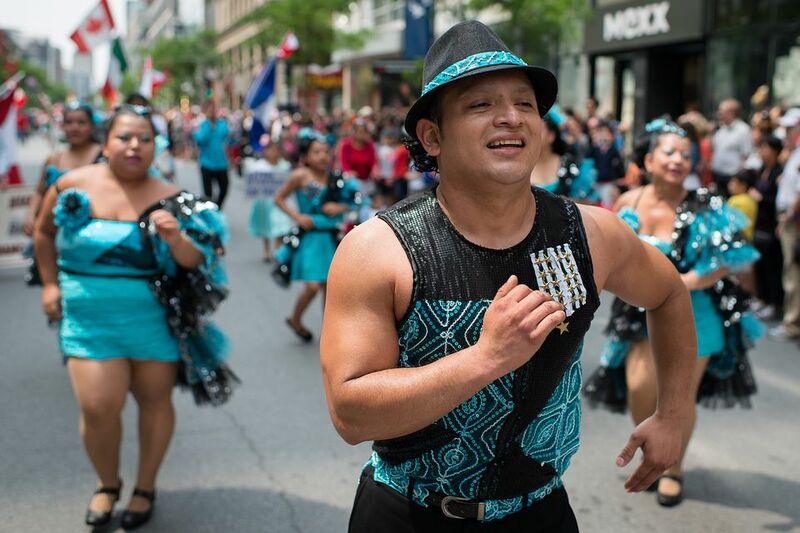 The size of the parade and public participation grew as several of Montreal's ethnic communities began to get involved. As a result, the parade also began to feature representations of cultures and traditions from all over the world including China, Germany, Armenia, India, Hungaria, Iran, Greece, Italy, Turkey, Indonesia, Poland, the Philippines, Denmark, Malaga, Holland, Sri Lanka, Ireland, and Japan. After the parade each year, Place du Canada hosts a special event featuring a giant cake, live shows, face painting, and other entertainment. Taking place at Square Phillips from 1:30 to 2 p.m., you can enjoy a slide of a 4-foot by 8-foot cake in honor of the holiday, which is expected to feed up to 2,500 people. Once you've grabbed a slice (and a free cup of water), you can stick around for the performances, including colorful dragon dances courtesy of Montreal's Chinese community. There will also be inflatable toys for kids on site and a variety of other activities and games available free of charge until around 4 p.m.